I have a very special Friday Freebie for you all today. I don’t ever try to be too ‘church-ee’ here, but there are some times that I think the message is special and can apply to all faiths. If you remember I talked about the new calling I have in church, which is being on a committee to do activities for the women each month. The group of women in our church is known as Relief Society. It’s an awesome photo! I love the candid shots like this! We are putting this on a painted and sanded black block and will then mod-podge it to do as a craft in a few weeks. So for those of you looking for an easy craft to do? Here’s the first part of today’s Friday Freebie. To download all four versions, click HERE. It comes in two sizes and two color variations for whatever your needs may be. Now, I realize that non-LDS people may like the message, but more than likely wouldn’t want a picture of the president of another faith in their home. :) So I made this word version that you can put on a scrapbook page or in your Project Life album. depending on if you like to see who quoted it or not. To download this forever free image, click HERE. Sweet, isn’t it? :) Those versions are in with the cards. I just really loved this sentiment. It couldn’t be said any better, really. 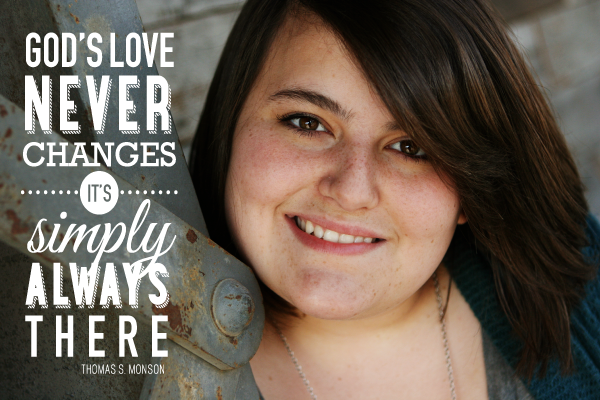 If you would like to read the entire message from Thomas S. Monson, you can find it HERE. This is so awesome Kerri thank you!!! I’d love to see you do something crafty with next years YM YW theme. “Come unto Christ, and be perfected in him, and deny yourselves of all ungodliness” (Moroni 10:32). Thanks, Kerri! Love this! Especially love your showing us how you put it on a photo of your beautiful Kassi-girl! Kerri!!!!!! I totally love this! This is my absolute favorite picture of President Monson. I have been wanting to do something with it for a while. Please share photos of the finished project. I would love to see it. Thank you so much! I can hardly wait to use this quote. It may just become Christmas gifts for my co-workers. These have to be my most favorite of all your “Freebies” ever! I can’t wait to make copies at Wal-Mart to give to the ladies I visit every month. This is just want I needed today … it’s what I’ve needed all week! I’ve been going through a lot of stress these last few months, some good and some not so good …. they’re all trials that I live through in my life. Thank you again, I will be having this in my home as a constant reminder. Thank you so much for the freebie. I will use this quote often! Love this Kerri! Thanks for the freebie! What a lovely kind looking face your church leader has and what beautiful words he speaks. I tried downloading the 2nd option with all of the colors but for some reason it’s not incorporated in the download and there’s only a black with no back or a white with no back. :( Could you let me know if maybe I missed something? Thank you for this beautiful file. It is a powerful message and I love it! Hope you have a wonderful weekend Kerri! Thanks so much for this freebie Kerri! What a wonderful (and true) quote! Thank you. There are so many times that I need just these words. And so many people with whom it will be wonderful to share — a RS pass along card — sort of.